This page lists Critical Care-related publications. For a full list of each group member’s publications, please navigate to their personal page using the menus above. Proudfoot AG, O’Kane CM, Bayliffe A, Serone A, Bareille PJ, Smith S, Brown V, Hamid UI, Wright T, Chen Y, Wilson R, Cordy J, van Wilte R, Morley P, Elborn JS, Hind M, Chilvers ER, Griffiths M, Summers C*, McAuley DF*. A domain antibody to the tumour necrosis factor receptor one (TNFR1) prevents pulmonary inflammation in experimental models of acute respiratory distress syndrome. Thorax 2018, in press. (* these authors contributed equally to this work). Cowburn AS, Macias D, Summers C, Chilvers ER, Johnson RS. Cardiovascular adaptation to hypoxia and the role of peripheral resistance. eLife 2017; 6:e28755. Jubb AW, Boyle S, Hume DA, Bickmore WA. Glucocorticoid receptor binding induces rapid and prolonged large-scale chromatin decompaction at multiple target loci. Cell Rep 2017; 21:3022-3031. Ekpenyong AE, Töpfner N, Fiddler C, Herbig M, Li W, Cojoc G, Summers C, Guck J, Chilvers ER. Mechanical deformation induces depolarisation of neutrophils. Science Advances, 2017; 3:e1602536. Alves J, Alp E, Koulenti D, Zhang Z, Ehrmann S, Blot S, Bassetti S, Conway-Morris A, Reina R, Teran E, Sole-Lleonart C, Ruiz-Rodríguez M, Rello J and SANEME-2 Investigators. Nebulization of antimicrobial agents in mechanically ventilated adults in 2017: an international cross-sectional survey. Eur J Clin Micro Infect Dis 2017, in press. Dorward D, Lucas CD, Doherty MK, Chapman GB, Scholefield E, Conway Morris A, Felton JM, Kipari T, Humphries D, Robb CT, Simpson AJ, Whitfield P, Haslet C, Dhaliwal K, Rossi AG. Novel role for endogenous mitochondrial formylated peptide-driven formyl peptide receptor 1 signalling in Acute Respiratory Distress Syndrome. Thorax 2017; 72:928-936. Conway Morris A, Wilson J, Shankar-Hari M. Immune activation in sepsis. Critical Care Clinics. On-line October 12 2017. Conway Morris A, Gadsby N, McKenna JP, Hellyer TP, Dark P, Singh S, Walsh TS, McAuley DF, Templeton K, Simpson AJ, McMullan R. 16S pan-bacterial PCR can accurately identify patients with ventilator-acquired pneumonia. Thorax 2017; 72:1046-1048. Summers C, Singh NR, Worpole L, Simmonds R, Babar J, Condliffe AM, Gunning KE, Johnston AJ, Chilvers ER. Incidence and recognition of acute respiratory distress syndrome in a UK intensive care unit. Thorax 2016; 71:1050-1051. Juss JK, House D, Amour A, Begg M, Herre J Storisteanu DML, Hoenderdos K, Bradley G, Lennon M, Summers C, Hessel EM, Condliffe AM and Chilvers ER. ARDS neutrophils have a distinct phenotype and are resistant to phophoinositide 3-kinase inhibition. Am J Respir Crit Care Med 2016; 194:961-973. Hoenderdos K, Lodge K, Hirst RA, Chen C, Palazzo SGC, , Emerenciana A, Summers C, Angyal A, Porter L, Juss JK, O’Callaghan C, Chilvers ER, Condliffe AM. Hypoxia up-regulates neutrophil degranulation and potential for tissue injury. Thorax 2016; 71:1030-1038. Millar FR, Summers C, Griffiths MJ, Toshner MR, Proudfoot AG. The pulmonary endothelium in the Acute Respiratory Distress Syndrome – insights and therapeutic opportunities. Thorax 2016; 71:462-473. Datta D, Conway Morris A, Antonelli J, Warner N, Brown KA, Wright J, Simpson AJ, Rennie J, Hulme G, Lewis SM, Mare TA, Cookson S, Weir CJ, Dimmick I, Keenan J, Rossi AG, Shankar-Hari M, Walsh TS, for the ExPRES Sepsis Investigators. Early PREdiction of Severe Sepsis (ExPRES-Sepsis) study: protocol for an observational derivation study to discover potential leucocyte cell surface biomarkers. BMJ Open 2016; 6:e011335. Hellyer TP; Anderson NH; Parker J; Dark P; Van Den Broeck T; Singh S; McMullan R; Agus A; Emerson LM; Blackwood B; Gossain S; Walsh TS; Perkins GD; Conway Morris A; McAuley DF; Simpson AJ Effectiveness of a biomarker-based exclusion of ventilator-acquired pneumonia to reduce antibiotic use: study protocol for a randomised controlled trial (VAPrapid-2). Trials. 2016; 17:318. Conway Morris A, Datta D, Shankar-Hari M, Weir CJ, Rennie J, Antonelli J, Rossi AG, Warner N, Keenan J, Wang A, Brown KA, Lewis S, Mare T, Simpson J, Hulme G, Dimmick I*, Walsh TS. The predictive value of cell-surface markers in infections in critically ill patients: protocol for an observational study (ImmuNe FailurE in Critical Therapy (INFECT) Study). BMJ Open 2016; 6:e011326. Nolan TJ, Gadsby NJ, Hellyer TP, Templeton KE, McMullan R , McKenna JP, Rennie J, Robb CT, Walsh TS, Rossi AG, Conway Morris A*, Simpson AJ*. Low-pathogenicity Mycoplasma species alter human monocyte and macrophage function and are highly prevalent amongst patients with ventilator-acquired pneumonia. Thorax 2016; 71:594-600. (* these authors contributed equally to this work). Gadsby NJ, Russell CD, McHugh MP, Mark M, Conway Morris A, Laurenson IF, Hill AT, Templeton KE. Comprehensive molecular testing for respiratory pathogens in community-acquired pneumonia. Clin Infect Dis 2016; 62:817-23. Jubb AW, Young RS, Hume DA, Bickmore WA. Enhancer turnover is associated with a divergent transcriptional response to glucocorticoid in mouse and human macrophages. J Immunol 2016 ;196:813-22. Lambden S, Martin D, Vanezis K, Lee B, Tomlinson J, Piper S, Boruc O, Mythen M, Leiper J. Hypoxia causes increased monocyte nitric oxide synthesis which is mediated by changes in Dimethylarginine Dimethylaminohydrolase-2 expression in animal and human models of normobaric hypoxia. Nitric Oxide 2016; 58:59-66. Kirkman MA, Lambden S, Smith M. Challenges in the anesthetic and intensive care management of acute ischemic stroke. J Neurosurg Anesthesiol 2016; 28:214–232. Scott J, Harris GJ, Pinder EM, Macfarlane JG, Hellyer TP, Rostron AJ, Conway Morris A, Thickett DR, Perkins GD, McAuley DF, Widdrington JD, Wiscombe S, Baudouin SV, Roy AI, Linnett VC, Wright SE, Ruchaud-Sparagano MH, Simpson AJ. EPAC activation reverses neutrophil dysfunction induced by b2-agonists, corticosteroids and critical illness. J Allergy Clin Immuno. 2016; 137:535-44. Lambden S, Kelly P, Wang Z, Ahmetaj B, Nandi M, Torondel B, Delahaye M, Dowsett L, Tomlinson J, Caplin B, Boruc O, Slaviero A, Khadayate S, Lee B, Leiper J. Dimethylarginine Dimethylaminohydrolase-2 regulates nitric oxide production, haemodynamics and vascular responsiveness under basal conditions and outcome in polymicrobial sepsis. Arterioscler Thromb Vasc Biol 2015; 35:1382-1392. Hellyer TP, Conway Morris A, McAuley DF, Walsh TS, Anderson NH, Singh S, Dark P, Roy AI, Baudouin S, Wright SE, Perkins GD, Kefala K, Jeffels M, McMullan R, O’Kane C, Spencer C, Laha S, Robin N, Gossain S, Gould K, Ruchaud-Sparagno MH, Scott J, Browne EM, Macfarlane JG, Wiscombe S, Widdrington JD, Dimmick I, Laurenson IF, Nauwelaers F, Simpson AJ. Diagnostic accuracy of pulmonary host inflammatory mediators in the exclusion of ventilator-acquired pneumonia. Thorax 2015; 70:41-7. Webb S, Samanta R. Angiotensin–neprilysin inhibition versus enalapril in heart failure. Intensive Care Monitor 2015; 22:4-5. Summers C, Singh NR, White JF, Mackenzie IM, Johnston A, Solanki C, Balan KK, Peters AM, Chilvers ER. Pulmonary retention of primed neutrophils: a novel protective host response, which is impaired in acute respiratory distress syndrome. Thorax 2014; 69:623-629. Summers C, Chilvers ER, Peters AM. Mathematical modelling supports the presence of neutrophil de-priming in vivo. Physiological Reports 2014; 2:e00241. Proudfoot AG and Summers C. Killing without collateral damage: A new hope for sepsis therapy. Immunol Cell Biol 2014; 94:739-40. Browne E, Hellyer TP, Baudouin SV, Conway Morris A, Linnett V, McAuley DF, Perkins GD, Simpson AJ. A national survey of the diagnosis and management of suspected ventilator-associated pneumonia. BMJ Open Respir Res 2014; 16:e000066. Moncayo-Nieto OL, Wilkinson TS, Brittan M, McHugh BJ, Jones RO, Conway Morris A, Walker WS, Davidson DJ and Simpson AJ. Differential response to bacteria, and TOLLIP expression, in the human respiratory tract. BMJ Open Resp Res 2014; 1:e000046. Jones RO, Brittan M, Anderson NH, Conway Morris A, Murchison JT, Walker WS, John Simpson A. Serial characterisation of monocyte and neutrophil function after lung resection BMJ Open Resp Res 2014; 1:e000045. Jiwaji Z, Nunn K, Conway Morris A, Wyncoll D, Simpson AJ, Rossi A, Walsh T. Leuco-depleted blood transfusion does not produce an inflammatory response in critically ill adults, results from a randomised controlled trial. Transfusion 2014; 54:2404-11. Brittan M, Barr LC, Anderson N, Conway Morris A, Duffin R, Marwick JA, Rossi F, Johnson S, Dhaliwal K, Hirani N, Rossi AG, Simpson AJ Functional characterisation of human pulmonary monocyte-like cells in lipopolysaccharide-mediated acute lung inflammation. J Inflamm 2014 ;11:9. Wang Z, Lambden S, Taylor V, Sujkovic E, Nandi M, Tomlinson J, Dyson A, McDonald N, Caddick C, Singer M, Leiper J. Pharmacological inhibition of DDAH1 improves survival, hemodynamics and organ function in experimental septic shock. Biochem J 2014; 460:309-316. Ferguson GD, Gadsby NJ, Henderson SS, Hardie A, Kalima P, Conway Morris A, Hill AT, Cunningham S, Templeton KE. Clinical outcomes and macrolides resistance in mycoplasma pneumoniae infection in Scotland. J Med Microbiol 2013; 62:1876-82. Conway Morris A, Anderson N, Brittan M, Wilkinson TS, McAuley DF, Antonelli J, McCulloch C, Barr LC, Dhaliwal K, Jones RO, Haslett C, Hay AW, Swann DG, Laurenson IF, Davidson DJ, Rossi AG, Walsh TS, Simpson AJ. Combined dysfunctions of immune cells predict nosocomial infection in critically ill patients. Br J Anaesth 2013; 111:778-87. Barr LC, Brittan M, Conway Morris A, McAuley DF, McCormack C, Fletcher AM, Richardson H, Connell M, Patel D, Wallace WA, Rossi AG, Davidson DJ, Manson L, Turner M, Hirani N, Walsh TS, Anderson NH, Dhaliwal K, Simpson AJ. An RCT of peripheral blood mononuclear cell depletion in experimental human lung inflammation. Am J Respir Crit Care Med 2013; 188:449-55. Lambden S, De Munter C, Gautama S, Cooper M, Sevdalis N. The Imperial Paediatric Emergency Training Toolkit (IPETT) for use in paediatric emergency training: Development and evaluation of feasibility and validity. Resuscitation 2013; 84:831-836. Walker S, Sevdalis N, McKay A, Lambden S, Gautama S, Vincent C. Unannounced In Situ Simulations: Integrating training and clinical practice. BMJ Qual Safe 2013; 22:453-458. Farahi N, Singh NR, Heard S, Loutsios C, Summers C, Simmonds RP, Solanki CK, Solanki K, Balan KK, Ruparelia P, Peters AM, Condliffe AM, Chilvers ER. Use of 111-Indium-labelled autologous eosinophils to establish the in vivo kinetics of human eosinophils in healthy subjects. Blood 2012; 120: 4068-4071. Singh N, Johnston A, Peters AM, Babar J, Chilvers ER, Summers C. Acute lung injury results from failure of neutrophil de-priming: a new hypothesis. Eur J Clin Invest 2012; 42: 1342-1349. Barr L, Brittan M, Conway Morris A, Stewart A, Dhaliwal K, Anderson N, Turner M, Manson L, Simpson AJ. Pulmonary and systemic effects of mononuclear leukapheresis. Vox Sang 2012;103:275-83. Dhaliwal K, Scholefield E, Ferenbach D, Gibbons M, Duffin R, Dorward DA, Conway Morris A, Humphries D, MacKinnon A, Wilkinson TS, Wallace WA, van Rooijen N, Mack M, Rossi AG, Davidson DJ, Hirani N, Hughes J, Haslett C, Simpson AJ. Monocytes control second-phase neutrophil emigration in established LPS-induced murine lung injury. Am J Respir Crit Care Med 2012; 186:514-24. Wilkinson TS, Conway Morris A, Kefala K, O’Kane CM, Moore NR, Booth NA, McAuley DF, Dhaliwal K, Walsh TS, Haslett C, Sallenave JM, Simpson AJ. Ventilator-associated pneumonia is characterized by excessive release of neutrophil proteases in the lung. Chest 2012; 142:1425-32. Brittan M, Barr L, Conway Morris A, Duffin R, Rossi F, Johnston S, Monro G, Anderson N, Rossi AG, McAuley DF, Haslett C, Hirani N, Dhaliwal K, Simpson AJ. A novel monocyte-like subpopulation in the human lung following LPS inhalation. Eur Resp J 2012; 40:206-14. McGovern NN, Cowburn AS, Porter L, Walmsley SR, Thompson AA, Summers C, Willcocks LC, Whyte MKB, Condliffe AM, Chilvers ER. Hypoxia inhibits respiratory burst activity and killing of staphylococcus aureus in human neutrophils. J Immunol 2011; 186: 453-463. Din JN, Aftab SM, Jubb AW, Carnegy FH, Lyall K, Sarma J, Newby DE, Flapan AD. Effect of moderate walnut consumption on lipid profile, arterial stiffness and platelet activation in humans. Eur J Clin Nutr. 2011; 65:234-9. Szczepura KR, Ruparelia P, Solanki CK, Balan KK, Newbold P, Summers C, Chilvers ER, Peters AM. Measuring whole-body neutrophil redistribution using a dedicated whole body counter and ultra-low doses of 111-Indium (whole body counting). Eur J Clin Invest 2011; 41: 77-83. Cowburn AS, Summers C, Dunmore BJ, Farahi N, Hayhoe RP, Print CG, Cook SJ, Chilvers ER. GM-CSF causes a paradoxical increase in the BH3-only protein Bim in human neutrophils. Am J Respir Cell Mol Biol 2011; 44: 879-887. White JF, Cowburn AS, Summers C, Cadwallader KA, Mackenzie I, Prasaedom RJ, Peters AM, Chilvers ER. The influence of the spleen on neutrophil apoptosis in vivo. J Cell Death 2011; 4: 1-5. Ruparelia P, Szczepura K, Summers C, Solanki CK, Balan KK, Newbold P, Bilton D, Peters AM, Chilvers ER. Quantification of 111In-neutrophil migration into the lungs of patients with chronic obstructive pulmonary disease. Eur J Nucl Med Mol Imaging 2011; 38: 911-919. Conway Morris A, Hay AW, Swann DG, Everingham K, McCulloch C, McNulty J, Brooks O, Laurenson IF, Cook B, Walsh TS. Reducing ventilator-associated pneumonia in Intensive Care: impact of implementing a care bundle. Crit Care Med 2011; 39:2218-24. Conway Morris A, Brittan M, Wilkinson TS, McAuley DF, Antonelli J, McCulloch C, Barr LC, McDonald NA, Dhaliwal K, Jones RO, Mackellar A, Haslett C, Hay AW, Swann DG, Anderson N, Laurenson IF, Davidson DJ, Rossi AG, Walsh TS, Simpson AJ. C5a-mediated neutrophil phagocytic dysfunction is RhoA-dependent and predicts nosocomial infection in critically ill patients. Blood 2011; 117:5178-88. Lambden S and Martin B. 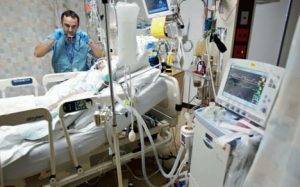 The use of computers for perioperative simulation in anesthesia, critical care and pain medicine. Anesthesiol Clin 2011; 29:521-531. Walker S, Brett S, McKay A, Lambden S, Vincent C, Sevdalis N. Observational skill-based clinical assessment tool for resuscitation (OSCAR): Development and validation. Resuscitation 2011; 82:835-44. Samanta R, Shoukrey K, Griffiths R. Rheumatoid Arthritis and Anaesthesia. Anaesthesia 2011; 66:1146-1159. Summers C, Rankin SM, Condliffe AM, N Singh, Peters AM, ER Chilvers. Neutrophil kinetics in health and disease. Trends Immunol 2010; 31:318-324. Conway Morris A, Forrest R, Campbell A. Thrombo-prophylaxis in intensive care: a nationwide, multi-disciplinary quality improvement project. JICS 2010; 11:2-6. Lambden S, Tunnicliffe G. Clinical skills training offers sustained benefits over experiential learning alone in foundation trainees. Int J Clin Skills. 2010; 4:78-86. Lambden S, Akeru J, Barrett N. Acute intravascular haemolysis secondary to meropenem administration in a 64 year old man. Can J Clin Pharmaco. 2010; 17:64-66. Conway Morris A, Kefala K, Wilkinson TS, Moncayo-Nieto OL, Dhaliwal K, Farrell L, Walsh TS, Mackenzie SJ, Swann DG, Andrews PJ, Anderson N, Govan JR, Laurenson IF, Reid H, Davidson DJ, Haslett C, Sallenave JM, Simpson AJ. Diagnostic importance of pulmonary interleukin-1 beta and interleukin-8 in ventilator-associated pneumonia. Thorax 2010 65: 201-207. Ruparelia P, Szczepura K, Summers C, Peters AM, Chilvers ER. 99m-Technetium-labelled neutrophil scanning in pneumonia. Thorax 2009; 64:92. Gooptu B, Miranda E, Nobeli I, Mallya M, Purkiss A, Leigh-Brown SC, Summers C, Phillips RL, Lomas DA, Barrett TE. Crystallographic and cellular characterisation of two mutations stabilising the native fold of alpha1-antitrypsin: implications for rational drug design. J Mol Biol 2009; 387:857-68. Lowder B, Guinane C, Ben Zakor N, Weinert L, Conway Morris A, Cartwright R, Simpson AJ, Rambaut A, Nubel U, Fitzgerald JR. Recent human to poultry host jump, adaptation, and pandemic spread of Staphylococcus aureus. PNAS 2009; 106:19545-19550. Conway Morris A, Howie N. Pain in medical patients:an underrecognised problem? J R Coll Physicians Edinb 2009; 39:292-5. Conway Morris A, Kefala K, Wilkinson TS, Dhaliwal K, Farrell L, Walsh T, Mackenzie SJ, Reid H, Davidson DJ, Haslett C, Rossi AG, Sallenave JM, Simpson AJ. C5a mediates peripheral blood neutrophil dysfunction in critically ill patients. Am J Respir Crit Care Med 2009; 180:19-28. Conway Morris A, Kefala K, Simpson AJ, Wilkinson TS, Everingham K, Kerslake D, Raby S, Laurenson IF, Swann DG, Walsh TS. Evaluation of diagnostic methodology on the reported incidence of ventilator-associated pneumonia. Thorax 2009; 64:516-522. Wilkinson TS, Dhaliwal K, Hamilton TW, Lipka AF, Farrell L, Davidson DJ, Duffin R, Conway Morris A, Haslett C, Govan JR, Gregory CD, Sallenave JM, Simpson AJ. Trappin-2 promotes early clearance of Pseudomonas aeruginosa through CD14-dependent macrophage activation and neutrophil recruitment. Am J Pathol 2009; 174:1338-1346. Cowburn AS, Condliffe AM, Farahi N, Summers C, Chilvers ER. Advances in neutrophil biology: clinical implications. Chest 2008; 134: 606-612. Durrington HJ, Summers C. Recent changes in the management of community acquired pneumonia. BMJ 2008; 336:1429-1433. Enoch DA, Summers C, Brown NM, Moore L, Gillham MI, Burnstein RM, Thaxter R, Enoch LM, Matta B, Sule O. Investigation and management of an outbreak of multidrug-carbapenem-resistant Acinetobacter baumannii in Cambridge, UK. J Hosp Infect 2008; 70:109-118. Proudfoot AG and Summers C. Respiratory disorders: ARDS in Cardiothoracic ICU. In Core Topics in Cardiothoracic Critical Care 2nd edition. Eds: Valchanov K, Jones, N, Hogue, C. Cambridge University Press, UK, in press. Lambden S and Summers C. Bridging the translational gap – the challenges of novel drug development in critical care. In: Annual Update in Intensive Care and Emergency Medicine 2017. Springer (Heidelberg, Germany): pp 375-388. Summers C and Belligan G. Therapeutic strategy for acute respiratory distress syndrome (ARDS). In: Oxford Textbook of Critical Care Medicine 2nd edition. Eds: Webb A, Angus D, Finfer S, Gattinoni L, Singer M. Oxford University Press, 2016. Loutsios C, Farahi N, Summers C, Ruparelia P, White JF, Potts J, Solanki CK, Solanki K, Heard S, Gillett D, Balan KK, Condliffe AM, Peters AM, Chilvers ER. Use of Radiolabelled Leukocytes for Drug Evaluation in Man. In: Pharmaco-Imaging in Drug and Biologics Development: Fundamentals and Applications. Eds: Moyer BR, Chevuvu, Hu TCC. Springer, New York, 2014. Conway Morris A, Simpson AJ, Walsh TS. Hyperinflammation and mediators of immune suppression in critical illness. In Vincent JL, ed. 2013. Annual Update in Intensive Care and Emergency Medicine 2013. Berlin, Springer: pp 135-144.